Forest Log Inn is a comfortable Bed & Breakfast facility with the option to nestle in at our fully equipped self catering Log home. Our cabin is ideal for business people on the move or for the whole family. 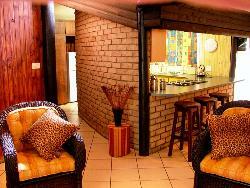 It is also perfect for a weekend break away or that special occasion. At our Log Inn you will find comfort, peace of mind and a night’s pleasant rest in a warm log atmosphere. Forest Log Inn was established in 2005 to serve as a comfortable and unique accommodation facility. Driven by a passion for both excellent service and the incredible satisfaction from pleased customers, Forest Log Inn promises to deliver an unforgettable experience. Enjoy the elegant atmosphere of our double room with its stylish en-suite bathroom. Treat yourself with the warm cosy atmosphere of a pure log room, with its classic en-suite bathroom. Book our enchanting cabin for a private break away or bring your whole family. Sleeps one couple and one single person. Sleeper couch in living area sleeps two. Please contact us for a special rate on our Cabin.